The Rolex Cosmograph Daytona is one of the world's most coveted models. It makes the perfect investment: Stainless steel watches are rare and appreciate in value. Paul Newman's personal Daytona sold at auction for 17.75 million USD. The Rolex Cosmograph Daytona has enjoyed widespread popularity for years. Demand has gotten so high that purchases from offline retailers often come with wait times ranging from several months to years. New stainless steel watches are especially sought after and sell online for prices well above their official list prices. For example, the 2016 Daytona ref. 116500LN officially costs 12,400 USD, but has a going rate of almost 23,000 USD online. Pre-owned, this timepiece costs only a few hundred dollars less. Prices for rare vintage Cosmographs from the 1960s can reach astronomical figures. The best example of this is Paul Newman's personal Daytona, which the actor and racecar driver wore every day. This 37-mm watch with a distinctive "exotic" dial sold at an auction in New York for an astonishing 17.75 million USD in 2017, making this manual chronograph the world's most expensive wristwatch. Comparable models with the reference number 6239, but no celebrity connection cost substantially less. Even so, they never sell for under 280,000 USD. 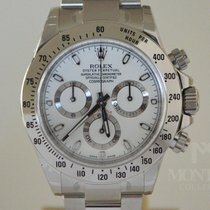 How much does a Rolex Cosmograph Daytona cost? 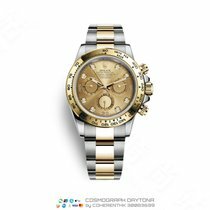 The Rolex Cosmograph Daytona comes in an almost endless variety of stainless steel, gold, or platinum models. The platinum model debuted in 2013 and features an icy blue dial and chestnut brown ceramic bezel. Its characteristic Rolex Oyster bracelet is also made of platinum and features polished inner links and satin-brushed outer links with polished sides. This platinum watch costs a solid 68,000 USD in mint condition and only slightly less pre-owned, making it a sound investment. If you're looking for a flashier timepiece, you may enjoy the Daytona in yellow or Everose gold. "Everose gold" is Rolex's name for their proprietary rose gold. A new, gem-studded Everose gold model premiered in 2018: theRolex Rainbow. On its bezel, you'll find 36 baguette-cut sapphires in every shade of the rainbow. A further 11 sapphires mark the hours on the dial. To top it all off, this Genevan manufacturer set the case with 56 diamonds. A new Rolex Rainbow, ref. 116595RBOW, demands around 284,000 USD. You can find pre-owned timepieces for about 244,000 USD. 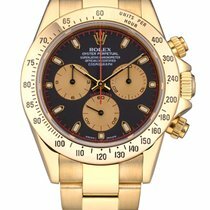 A gold Daytona without gemstones is much more affordable. You can purchase the Everose gold edition with a matching gold bezel for some 33,500 USD new and 30,000 USD pre-owned. The yellow gold version costs about the same, while the white gold model changes hands for slightly less. Mint-condition pieces sell for around 33,000 USD, while pre-owned watches demand about 26,000 USD. The gold Cosmograph has been available with a black ceramic bezel and black Oysterflex bracelet since 2017. This bracelet is composed of flexible metal blades encased in rubber, which Rolex refers to as Elastomer. Elastomer is especially durable and flexible. Set aside between 27,000 and 29,500 USD for this gold watch in mint condition. These timepieces tend to retain their value, so pre-owned pieces cost only marginally less. Two-tone Rolex Cosmograph Daytona models actually cost less than their stainless steel counterparts. This is particularly perplexing, considering the high price of gold. In the end, it all comes down to demand. Since stainless steel Rolex watches tend to be more desirable, their prices come in above the equivalent models in steel and gold. The ref. 116503 demands about 15,500 USD pre-owned and 17,000 USD new. Older models from the 90s sell for even less. They feature the Rolex caliber 4030 based on the legendary Zenith El Primero. With any luck, you might find the Rolex Cosmograph Daytona ref. 16523 in good condition for under 11,000 USD. Never-worn examples are hard to come by today and still cost around 16,500 USD. How much does a vintage Rolex Cosmograph cost? Vintage Daytonas are often much more expensive than models produced in the last few years. One reason for this is that chronographs from the 60s, 70s, and 80s are extremely rare. What's more, some timepieces come with a unique history that makes them all the more appealing to collectors – take the Paul Newman Daytona, for example. The main feature of this Cosmograph is its multicolored "exotic dial" with Art Deco numerals. Another defining detail is the set of small boxes at the end of the subdial indices. Beyond its so-called "exotic" dial, this model is no different than the standard Cosmograph Daytona. Watches with an exotic dial were slow sellers when they first debuted, so Rolex only produced them in limited quantities. Today, the Paul Newman Daytona is one of the most coveted vintage watches of all time. Prices over 227,000 USD are the norm. Many collectors would do anything to get their hands on a first-generation timepiece. If you're interested in purchasing one of the original Rolex Cosmographs, you should keep an eye out for the reference number 6239. The earliest models only have "Rolex Cosmograph" inscribed on their dials. The "Daytona" wasn't added until the mid-1960s. Other features of the ref. 6239 include pump pushers, a steel bezel with an engraved tachymeter scale, a 37-mm case, and the manual Valjoux caliber 72. Buying an original Rolex Daytona Cosmograph requires an investment of around 63,000 USD for a pre-owned timepiece. Cosmographs with the reference numbers 6241 and 6240 are equally interesting. The former is comparable to the ref. 6239, but has a Bakelite, or plastic, bezel. Set aside at least 96,500 USD for this rare timepiece. The ref. 6240 is even rarer and was the first water-resistant Daytona thanks to its screw-down push-pieces. Furthermore, it was the first model to add the word "Oyster" to its dial. Like the ref. 6241, it has a Bakelite bezel and was manufactured in the 1960s. Prices for the Cosmograph ref. 6240 sit between 45,000 and 102,000 USD. The 1970s and 80s saw two new Cosmograph Daytona models: one with a Bakelite bezel and the other with a steel bezel. Both featured improved screw-down crowns and increased water resistance. Their crowns were also much larger than those on previous models. The ref. 6265 has a steel bezel and case and sells for 62,000 to 113,000 USD, depending on its condition and whether or not it comes with its box and papers. The yellow gold edition can cost up to 170,000 USD. The version with a Bakelite bezel bears the reference number 6263 and changes hands for as little as 34,000 USD. The timepiece's condition and rarity also affect its price, with some models demanding over 136,000 USD. Prices for gold watches can reach up to 227,000 USD. The 1988 release of the Cosmograph Daytona ref. 16520 marked this collection's entry to the automatic age. However, instead of an in-house movement, Rolex equipped this watch with a highly modified version of the Zenith El Primero, known as the caliber 4030. The result was an El Primero that ticks at "only" 28,800 alternations an hour. Usually, this movement has a frequency of 36,000 A/h. Lowering the frequency allows for an increased power reserve and longer periods between services. The inscription "Superlative Chronometer Officially Certified" first appeared on the dial of the Daytona ref. 16520. Other new features included contrasting rings around the edge of the subdials and a larger, more contemporary 40-mm case. If you're interested in a pre-owned model, be sure to have around 29,500 USD on hand. Mint-condition pieces are extremely rare and often sell for more than 46,500 USD. Prices for the 18-karat yellow gold edition range from 32,000 USD pre-owned to 49,000 USD new. In 2000, Rolex replaced the El Primero-based caliber 4030 with their in-house caliber 4130 . This movement was developed entirely in-house and has a 72-hour power reserve. It ticks at a frequency of 28,800 A/h and deviates by only +2/-1 seconds per day. If you look at the watch details, you'll be able to recognize the change in movement on the dial: The small seconds dial has shifted from 9 to 6 o'clock. A few years later, Rolex began outfitting the caliber 4130 with their own Parachrom Bleu hairspring. Mint-condition stainless steel watches with the reference number 116520 cost around 22,500 USD. Pre-owned timepieces change hands for about 17,000 USD. These watches have performed well in recent years. The two-tone edition is a bit more affordable. It demands around 15,500 USD new and 12,500 USD pre-owned. In solid gold, this Cosmograph Daytona sells for between 27,000 and 30,500 USD. The Everose gold and white gold editions cost a few thousand dollars more. How much does a pre-Daytona cost? The Daytona's predecessor, the so-called "pre-Daytona," is almost as popular among fans and collectors as the rare Paul Newman chronograph. Defining features of the pre-Daytona, ref. 6238, are its polished bezel and the "Rolex Chronograph" inscription on the dial. These wristwatches bear neither the Cosmograph nor the Daytona name. Prices for these timepieces begin around 34,000 USD, but can easily surpass 113,000 USD. Where does the "Cosmograph Daytona" name come from? If you look at the history of the Rolex Cosmograph Daytona, you'll find numerous explanations for how it got its name. Some sources claim that "Cosmograph" comes from "cosmography" and was already being used in the 1950s to refer to a watch with a calendar function and moon phase display. Cosmography was the precursor to modern geography and dealt with the study of the universe and Earth, or cosmos. Whatever the case, the word "Cosmograph" appears on the dial of every Rolex chronograph today. However, this wasn't always the case. In the early days after its 1963 release, the Cosmograph Daytona was available with a number of different dials. 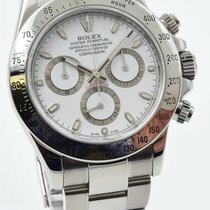 Some only featured the "Rolex" brand name, while others came with the "Cosmograph" or "Cosmograph Daytona" inscription. There's no doubt about where the second part of the name comes from. Its origin is the famed racetrack in Daytona, Florida. 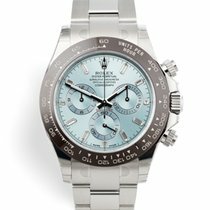 Rolex has been the official timekeeper and partner of the 24 Hours of Daytona race since 1962. Then as now, the winner received a Rolex Daytona with an engraved case back. This chronograph's name demonstrates its close connection to the world of motorsport.